I'm eventually going to order more., These are great for artiritis sufferers! need to hold on......to get balance........too big for any type of handle.....even used rubber bands.......so it wouldn't slide..didn't work.need to make smaller.......so it won't move...or put some velco on tape......so it can be form fitting. Very helpful for my husband, His hands are crippled up from RA. I think I will get some more for other doors. bought 4 for the doors I open most - had to have someone open doors for me before purchasing the doorknob grippers. I can't think of anything negative about them, I'm just so happy to have them. I have these on most of my doors, inside and out. They make the knob easier to grip and turn. Easy to install, just run some warm water on the "gripper" and slide it on the door knob. Works like a charm! I have progressing ALS and this device is very helpful to open closet doors. WOW! WOW! WOW! What took them so long? Even when my hands are wet I can still turn the knob. I was sceptical and only bought one. I am now ordering 5 more and will probably ordr more later for gifts because all my family love them. My mother is 87 and she loves them because of her arthritis. I have severe problems with my hands and can not grip. These have made my life much easier! Great product, better than anything else I have tried. I have several doorknobs that are difficult to open with arthritic hands. This help so much! The door to our garage,from the utility room, always was a problem to open. Not anymore. This is the only place that I have seen these, so I ordered 2 more. Very Good ...I'll be ordering another!! Door fixture used for a door!!!!! It's so much easier to get in from the garage with armful of groceries! For someone who has severe arthritis and turning door knobs is sometimes impossible, these grippers are a god send. In our area the ground shifts a lot and the doors are getting stuck and can not be opened by hand. With this on the door knob I can open the door without any help at all. This is great. I am older and have difficulty opening many things. These are a big help. Works great for "sticking" door knobs. Much help to older folks or anyone with weak wrists! I was pleasantly surprised to find out how easy these were to put on the door knob. Also, with having severe RA, just how easily I could open the doors now. I am definitely ordering another two! Increases ones hand grip on smooth door knob. Does what I wanted it to! We ordered these door knob covers so we could more easily open doors with gloves or mittens on without the door knob slipping through covered hand. My husband says it is to loose and you can get a grip on the door nob. Absolutely terrible - did not fit,was not flexible, completely unusable. Price, AND it is Rubber and hopefully will last for years. door knobs to home are cold. this product will help keep the coldness away from my fingers. Having A Harder time opening the door. My dad is 80 and has difficulty opening our doors. I thought something like this will make it easier. I just ordered, I dont have them yet so cant speak on how they look or work. Husband has issues with his hands. Need to use on shower handle that is a knob. I don't want to replace entire plumbling unit. Will give it a try. Plan to use it on a knob that is hard to turn or when my hands are wet or slippery. Did research and believe this product would best provide the ease needed to open doors. This will help with arthritic hands. I have a real hard time turning knobs. Hard to grip without it. We have glass door handles which are hard to open. My 91 y/o mom sometimes has trouble opening one of her doors going outside. Difficulty with smooth round doorknobs. I have a great deal of difficulty opening my linen closet door whiich has a round doorknob on it. Nerve damage to my hands make turning door knobs difficult to impossible. No more getting locked in rooms and having to call for help. For 105 yr old Aunt. Have difficulty with some door knobs and hopefully this will help. This makes turning a door knob easier when your hands are very arthritic. My mom has RA and these covers enable her to open doors without a struggle. I have R/A this wil make it easier to open my door. I live n a house we did NOT build and door knobs are so tight that I am fearful of getting stuck inside in case of fire. these I hope will remedy this problem of the tough door knobs. have trouble turning knobs. I am so glad to find these, have been hunting for years!! I have trouble turning door knobs so I thought I would try to see if it would help me. How durable is the material in extreme weather, specifically high heat? We have an exterior door that gets direct sun approximately 10 hours a day in the summer. BEST ANSWER: I use mine indoors on a daily basis and have bought them twice for all my doorknobs, so I think their durability is quite good. I've never seen any wear and tear on them. I can't vouch for how they would hold up in high heat, but my guess would be fairly well. They are so reasonably priced that I think it would be worth your while to purchase them and check it out. I have used these for more than 2 years, and find them to be very durable. Michigan has extreme temperatures-on & off all year: 95 to 100+ in summer, and -39 below in winter. These are as good as the day I received them !! Great for arthritic hands also !! I use them inside my house and really like them but I don't think they would last very long subjected to weather extremes. Probably not a great idea in high heat. What type of knobs does this fit. I have these Weiser Lock 9GAC1010-032e? Thank you. BEST ANSWER: Thank you for your question. It is approximately 2” inside and 2 ½” outside (from out edge of grip to outer edge of grip. This is a little stretchy, I’m am assuming you would need to work to get it on the doorknob but then it would stay on well. We hope this information will be of help to you. What circumference door knob will it fit? BEST ANSWER: Thank you for your question. 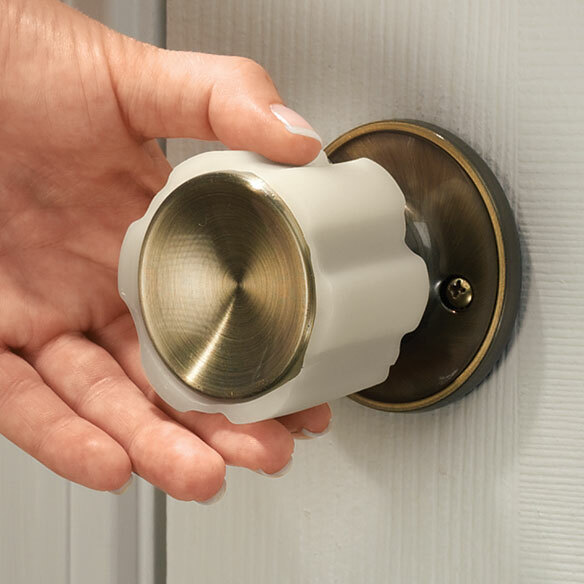 The Rubber Door Knob Cover will fit a handle up to 2" in diameter. We hope this information will be of help to you. BEST ANSWER: Thank you for your question. This comes a single Door Knob Cover. We hope this information will be of help to you. Comes 1 in a package. They work great. I have 4 of them and they fit most regular doorknobs. Will this fit on a circular door knob? BEST ANSWER: If you have older small circular door knobs, might not be a snug fit., but I have them on all my door knobs, even the older ones and they work great. you might need to readjust them occasionally, but they are a great help for arthritic hands. I love them, especially the price was very reasonable. Yes it does. The rounder the knob the more it gets cockeyed after a while and you have to adjust it. It works quite well though. Been using on my oval back door knob for years now. Most definitely. I have mine on a circular door knob. Really helps to grip the door without too much effort. 2"" is that the only size in the rubber door knob? BEST ANSWER: Thank you for your question. Yes that is the only size we carry. We hope this information will be of help to you.